In my last few posts, I’ve been talking about Mi Band, Mi Band 3 and the Mi Fit App. Have used all of them for quite some time and reviewed the same on the blog. In my previous post I mentioned the reasons why I don’t like Mi Fit App and the issues associated with it. If you read it till the end, you would know that I was going to write this post. There are hundreds of fitness trackers and thousands of fitness tracking apps. For me, it’s not viable to review all of the devices and the apps. I scrolled through the app list on Play Store and installed this one app. Have been using it for over a week now and I guess I can talk about it. So this post is going to be about Notify & Fitness app which is a great alternative to the Mi Fit App. There are free and PRO version available and I’ve purchased the PRO version for Rs 200. Why ? Well I had earnings from the Google Opinions Rewards Program which were expiring. You too can earn too, read here how. Notify & Fitness is a fitness tracking app that works well with most of the fitness trackers. They have different apps for different fitness bands too. For instance the one that I’m using is the Notify & Fitness for Mi Band. Similarly there are other versions available for FitBit too. If you’ve used any of the other official fitness tracking apps, you’re not going to like this one at all. The clean and minimal UI of official apps are way too good when compared to Notify & Fitness. The UI here is very basic and no gimmicks whatsoever. Moreover, for first timers it’s very difficult to follow the app. Even though the things are mentioned clearly, it does take some time to get used to it. The colors, fonts, images everything that’s used is very basic and nowhere close to the official apps. The reason why I was looking for an alternative to the Mi Fit App was the functionality. The Mi Fit App does have a decent bunch of functionalities however there are many which are absent. For instance Mi Fit App can’t sync heart rate details to the Google Fit app. Changing music tracks, layouts etc aren’t available on the official Mi Fit App. So below are the list of features that make Notify & Fitness the Best Mi Fit App alternative. Accurate Workout tracking – the app has a good list of predefined work outs and makes it easy to track workouts. Further for walking & running, the app uses GPS seamlessly and gives out a lot of details that Mi Fit app couldn’t. Syncing with Google Fit – In the PRO version of the app, you can control how the app sync the details from the Mi Band to Google Fit. The free version doesn’t allow that, especially with the heart move points. The app quickly allows you to sync all the values to Google Fit. Notification Customization – The Notify & Fitness app allows you to create notifications for n number of apps on your device with a lot of granularity. There are a lot of things like display text as well as the vibration pattern that you can control for every app. That’s insane ! Do a lot more with your smart phone – This app also notifies you of a lot of things from your phones. Things like call and app notifications are pretty common. But what if your phone is running out of battery ? Notify & Fitness can quickly send you a notification on your band about your phone’s battery so that you can quickly charge it. Auto Backup / Export options: One of the good things about the Notify & Fitness app is that it allows you to take automated backups (PRO version) and export/import files from other devices so that all your fitness details are in the same place. What else would you need ? 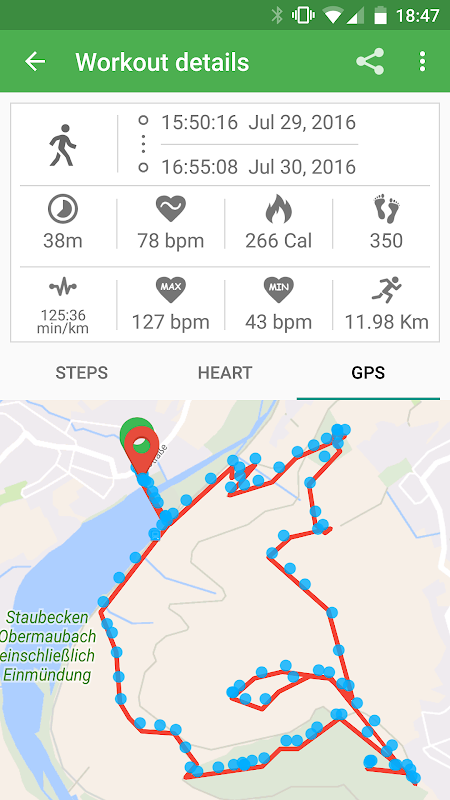 The Best Alternative to Mi Fit App ? Apart from some of the mentioned features, the app has a lot many which I still haven’t explored/understood. As and when I get anything, I’ll update this post. Now coming to the cons of the app, as I said the UI isn’t great and you will not like it. For some weird reason, I don’t know every time I’m tracking a work out using the app, Mi Band vibrates at regular intervals. No that interval isn’t time or steps. Haven’t been able to figure that out yet. If you know, do mention in the comments below. Mi Band 3 Review – the ultimate budget fitness band ?